Discombobulated Books we review books and stuff. so yeah. hi. nice to meet you. Sometimes, books in a series can be very hard to review, as you never know what the author is planning next. Maybe a character is left under-developed in this first book. But perhaps the author is only doing this to prepare ourselves for terrific, mind-blowing development in the next book. Or maybe the character is just going to die off screen and no one will surely give a crap. So I’ll do my best, however this review is subject to change as we shall see in the future where Maggie Stiefvater takes these characters. Because, oh, it has such brilliant potential. And I would hate for a potentially awesome series to fall flat on its face. So there’s a girl called Blue who is from a family of psychics, however is not psychic herself. When she kisses her true love, he’ll die – which is, you know, great. And then she finds this guy called Gansey who is meant to die within the next year, and he’s either her true love, or she’s going to kill him. Most likely both. Gansey’s obsessed with finding the “ley line” which is this cool supernatural thingy, so he, Blue, and his friends go and search for it. And also try not to die. This is more of a Con to reviewing this particular book than a Con for the book. Nothing much happens in this book, as a lot of it is just setting up for the bigger story as a whole, so it means that sometimes it can read slowly. This is made up for hugely with the amazing bromance and gorgeous writing style and awesome characters and so on. But nothing much happening means that it’s hard to tell if the story will speed up and become more interesting, or if it will stay at this slow walking pace. Usually this wouldn’t be a problem in books, however because this book did almost everything so impeccably well, I’m being especially harsh on it. I was hoping for a different scenario in which Blue’s friendship happens. I was wishing for more tension when Adam invited Blue over into the helicopter, however it was very easy and very fast. Her integration into such a tightly knit group was slightly strange to me, however it’s most likely because of their shared interest in the supernatural, and will probably be played on more in the later books, and it didn’t bother me as if this happened in most books, I would barely notice it. It’s the most obvious, because it’s the most brilliant. Friendships are easy to write. Close friendships aren’t too hard either. However, making them believable is the hard part, especially a friendship as close as this one. You know when you meet a group of friends, so incredibly and obviously close that you feel completely out of the loop, not because they’re excluding you, just because they are so freakishly in tune with each other? They share similar humour, manners of speaking and general interests. And of course, they each are different individuals, but you cannot deny those very prominent similarities that just develop after spending way too much time with each other. 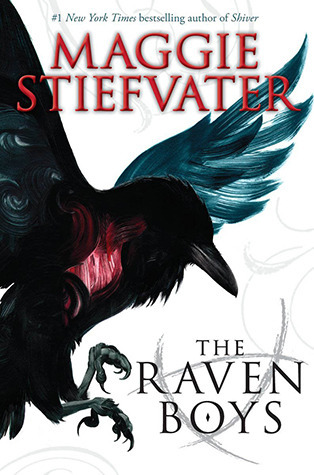 Maggie Stiefvater portrayed that beautifully, while also having each character very distinct and different from one another. How? I have no idea. A lot of times while reading this book, I would pause and reread a few pages, just trying to digest how she was so brilliant at writing these characters and their relationships. I wanted to do a critical study of The Raven Boys and see how she made the descriptions so gorgeously vivid, and the characters so fleshed out. The friendships have both tension and disagreements yet also intense care and fondness, and are brilliant portrayals (in the opinion of a girl who’s, obviously, never been to an exclusively male fancy private school) of high school students. She writes them with maturity, yet also a recklessness and naivety that comes with it. I love all the characters. I am not going to go into all the reasons why I love the characters, because I’m lazy and this review would get far too long, but let me promise you that all these characters are very individual, fitting to their situations and ages, all hold prominence in the story, and are all important to the plot. With a possible exception to Persephone and Calla, who’s backstorys and intents have not been revealed to the fullest (though they probably will soon. I’m so freaking curious about Persephone), every character has this brilliant past that contributes to the story, and without them, the book would probably be very different. And they were likeable! Hooray! Out of all the characters, I would say that Blue is the least developed (which is still extremely developed, however the standard of this book is just very high), however I have high hopes for her in the next books. I’m pretty sure this book earns an entire star just for the absolutely amazingly fantabulous writing style. Even if this book had been very bland in description, I still would have given it a high mark for the dialogue and characters alone, but add in the writing style of awesomeness and BAM, you have a great book. Just… the atmosphere and the word choice and the brilliance of it all is just… I want to read more Maggie Stiefvater books. I want to read them and let her magic with words soak into me like osmosis. The romance between Blue and Gansey did not go the route I expected it to take (and by that I mean there wasn’t any romance between them). Our lovely author could have taken it the very obvious route, but instead, we have Adam pining after Blue. Hopefully, if this turns into a messy love triangle, it will be a good love triangle that’s necessary to the plot. And the romance between Adam and Blue was believable! Yes, YA fiction! You have done it! A romance that does not make me want to throw up! I want to give this 5 stars very badly, but I’m going to withhold them for the very fact that it could go either way. This book does not scream to me immediate perfection, but I love it, all the same. And I am absolutely getting my hands on the sequel when it comes out. 4 3/4 shuriken stars. READ IT! Or don’t, if it doesn’t seem like your type of book, because it won’t be everyone’s. This book has been a saviour throughout wading through bad books, trying to not wonder if I’ve just used up all the good books, and that all books I stumble upon will be inherently bad. It’s given me a new source of hope that there are brilliant YA fiction books with good character development, solid plot, interesting characters, good writing and originality still out there, waiting to be read.